When it comes to rocks, wood, mussels and other line damaging debris, Mason's new "ROCK" will help reduce break offs. 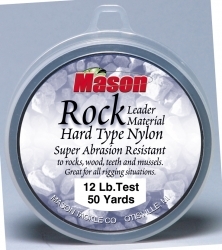 Popular for its stiffness and excellent resistance to abrasion, "ROCK" is the ideal leader material for Carolina rigging, bottom bouncing, drop-shooting, and a variety of fly presentations. I use the 16lb for making stinger hooks to use jigging the Detroit River. The line is stiff and rarely breaks. From walleye, catfish to muskie and pike, this stuff holds up very well. I bought a spool of this line (from Bass Pro Shops) to use as class tippet for my Tarpon leaders on my upcoming trip to Belize. When I got the line (I ordered it on the Internet) and examined it, I found that the entire 100 yard spool of line had abraded sections. So I've decided not to use it. Obviously Mason's QA department missed it on the stuff I received! I'm very dissappointed since my trip is nin two weeks and I;ll have to figure out something else to use for the class tippet materia.